Mark Gieseke got notice from scouts in 1988 just by going to work, his summer league manager told The Los Angeles Times that July. "He doesn't do anything fancy or spectacular," San Fernando Valley Dodger Manager Mark Morton told The Times. "He's just a guy who at the end of the day has three hits and three RBIs." Gieseke took that approach to the pros a year later. He went on to play professionally for six seasons, but he couldn't take his approach to the majors. 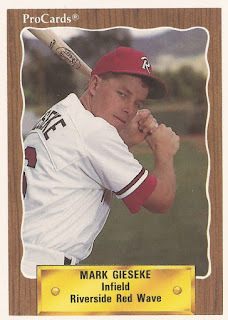 Gieseke's career began in 1989, taken by the Padres in the 35th round of the draft out of Cal State-Sacramento. At Sacramento, Gieseke won first-team Division II All-America in 1988, then made the third team in 1989. He hit .363 his final year, after hitting .449 in 1988. Gieseke started with the Padres at short-season Spokane. His stay there was brief. He got into three games before moving up to single-A Waterloo. He hit .289 over 42 total games on the year. "I liked Spokane," Gieseke told the Times shortly after moving to Waterloo. "but I'm not gonna complain about getting moved up." Gieseke moved to high-A Riverside for 1990. He also got five games at AAA Las Vegas. He hit .268, with four home runs overall. He played 1991 at high-A High Desert, then 1992 at AA Wichita. He hit .246 in his season at AA. His 1993 season was abbreviated. He got into just 20 games between Wichita and high-A Rancho Cucamonga. Gieseke continued playing in 1994, but in independent ball. He got into 78 games for Rio Grande Valley, hitting .320. It was his final season as a pro.